Because the total population had shrunk to less then 2000 adult individuals, the wildsheep has been on the edge of extinction several times. Once, in the beginning of the 1950`s Poul Moberg, Chief County Agricultural Officer, grasped the problem and founded Selbjørn Wildsheep Organization, with the purpose to protect the population of wildsheep in Austevoll. Most of the existing animals were at this time concentrated around Austevoll. This action of rescue by Poul Moberg and the wildsheep-owners in Austevoll is, in my opinion, one of the reasons why we today can continue to work with this interesting breed. In the 1980`s the decreasing interest for keeping wildsheep and the ever increasing age of the owners, forced Selbjørn Wildsheep Organization, to once again ask for help to save the wilsdsheep. Preservation was on possible action. There were several reasons why it was difficult to keep wildsheep, keywords are: production-subsidies, the rules for meat-classification, the Act of Animal Welfare, the Act of Keeping Male Animals, a small population, attitude in the agricultural organizations etc. Now the challenge was taken by the Office of Agriculture in Austevoll which later got excellent support from Austevoll municipality, Tiltaksfondet for småfe (a foundation for small ruminants), and especially the media, to make more people interested in this breed of sheep. The Chief County Agricultural Officer, Steinar Bø, facilitated cooperation between the University of Bergen and the Office of Agriculture in Austevoll, and a project on, and for the sheep was initiated. The results of this project showed that it was possible to do conventional farming with this breed, if one were able to find a way to sell the meat at a better price compared to what the slaughterhouses could offer. We founded therefore a national organization with the aim of taking care of the wildsheep. 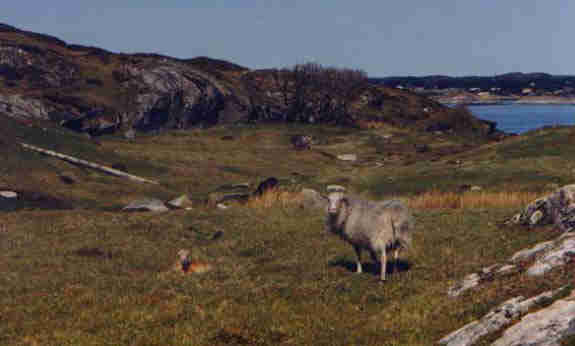 Later, it has become clear that the wildsheep was more widespread then first believed, but it was concentrated on the coast of Hordaland and South-Trøndelag counties. When we started the Norwegian Wildsheep Organization we believed there was approximately 2000 animals left in Norway. Later the number of animals exploded, and now the numbers are higher then 30.000. The Norwegian Wildsheep Organization became the Norwegian Wildsheep Organization Limited Company and a Product Manager was employed to take care of the marketing. This became a success, and we can look back at a rich period where the owners of wildsheep who were members of the organization got a guaranteed price for the meat they delivered. This project has shown that it is useful to think new and innovatively, and maybe has benefited by being before its time. It has not been easy to walk this road, but when the results are good you forget the hard times and the taunting laughter experienced when you talked about wildsheep 10 – 15 years ago. I believe that without the good help from the Product Manager and Project Coordinator, the media and especially the Ministry of Agriculture, we would have had severe problems in getting as far as we have come. I have kept wildsheep for more then 25 years and found this sheep more and more fascinating, and become more and more aware of that we have bred away many good qualities in our ordinary sheep. The wildsheep is unique in many ways and this makes it incredibly exiting to follow it trough the different seasons of the year. The most thrilling period is of course in springtime and during the kidding. It is amazing how well this sheep, which receives no additional fodder, can manage on marginal grazing-areas, like we have on the islands by the west coast, and perhaps especially here in Austevoll where we now are going to visit Horgo. Horgo is an island that has been abandoned, but where there still are well maintained houses only used during holidays. The island is situated far out in the sea and is often visited by boat-tourists, especially from Bergen, but also from abroad. The island is approximately 2000 da, and there is pasture for approximately 130-150animals during wintertime. 80 % of the grazing land consist of heather and juniper, the rest are old grass fields. No fertilizers are used. In addition the sheep graze at low tide on seaweed, which gives an important mineral supply all year through, but perhaps most during autumn and winter. Horgo, in my opinion is ideal for the wildsheep and its qualities. For most sheep owners the spring and kidding-time is so busy that one almost live in the barn to help the sheep while giving birth. One almost have to go into the ewe to get out the lambs; we turn them over and pull to get them out alive, and to save the mother. This is not how it should be, is it? 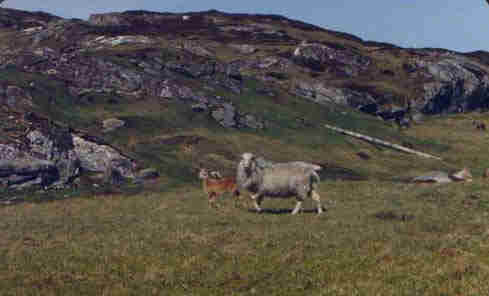 No, with the wildsheep is it fortunately not like this. On Horgo, as told previously, the sheep are outside all year, and we emphasize that the wildsheep are going to manage on their own. Still, we try as far as possible to stick to the law and the rules. My opinion is that looking after the sheep while it gives birth is misunderstood animal protection, because one se the wildsheep do what they wants no matter what we try to do. If one is going to look after the sheep during the period of kidding one must behave carefully and keep distant. Now the sheep need peace!!! It seems like the mother instinct is so strong that if we go inn and disturb the sheep during the kidding period we do something fundamentally wrong. It is natural for the ewe to live in small flocks in springtime, the rams are pushed away from the flock and they often join together in their own small groups. When time for giving birth approaches for one of the animals, this animals will retreat and hide under a big rock or juniper, preferably on a slope facing south, where it is calm, dry and warm. Here the lamb are born and the ewe does not return to the herd until after a few days. Now the lamb knows its mother well and the mother has got control over the lamb so that it follows the mother, which is necessary if the lambs are going to mange. There is many resons for this, but one of the more important is if a young sheep kept the lamb close to the herd there would bee a big risk that the leader-sheep in the herd would have taken over the role as the mother, especially if she does not already have a lamb of her own. Another reason is that birds of prey, which we have quite many of in the area, do not get a chance to catch the newborn lamb. The mother is now able to keep the lamb close by her side at all times, resulting in other sheep or predators not being able to take the lamb. This way one sheep after the other leave the herd to give birth and comes back to the same flock after a few days. The wildsheep are a good-milking breed and the lambs therefore grow very well in the beginning, and have no problems following the adult animals after a few days, even in difficult terrain. After kidding the sheep get together in their groups again, and go back to their normal daily routines where they at fixed times of the day go to the outer fields, to the home fields, and for a while to the sea to eat seaweed and sea tangle. These routines are so stable that you can almost set your watch by them. Every herd has its routine, so that one herd can use the home fields at daytime and another in the evening. The routes seem to differ with season of the year, grazing more on home fields during spring compared to in wintertime. At Horgo we gather the sheep twice a year. In June, approximately around the 24th, we gather the sheep to mark the lambs and cut the wool of the adults. We carefully notice sheep that do not have lambs, and sheep which do not shed their wool. In autumn, September and October, we collect the sheep to pick out the animals to be slaughtered and the breeders, in addition to sheep which are old and/or have other weaknesses. When we pick out the breeders is it, for us, important that the selection is made on the nature and sheep’s premises, as far as we can understand this. We emphasize not making our selection in orders to increase or decrease the size of our animals, because the size of the animals we have has been decided by natural selection for thousands of years. We renew approximately 5 – 10 % of the herd each year. Since the wild sheep produce well for 10-15 years, the renewing does not have to be higher. 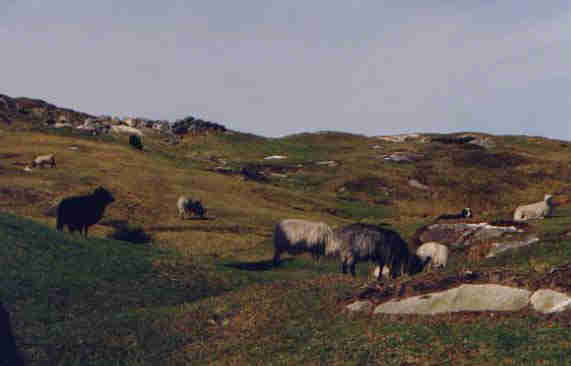 The rams are allowed to stay for approximately 2 years before they are replaced with rams from other herds in Austevoll. We have approximately 1 ram per 20 ewes. The rams are together with the ewes all year, so that mating and kidding occurs naturally. This is unproblematic, but demands that we are able use the premises of nature when we select the animals which are allowed to stay at Horgo. Kidding too early is not tolerated, and these ewes are taken away etc. Tending the pastures consists of burning heather. Old heather is burned in March, and the goal is not to let the heather become older then 20 to 30 years, which means that in the same number of years we ought to burn off the heather-moors all over the island. Of the 130 wintering sheep we have here at Horgo we have a yield of 0,9 lambs per sheep. The average bodyweight of each slaughtered lamb is 9 kg. The weight of the lambs has slightly increased since we began the burning of heather on the island. The meat from these animals is first class gourmet-food needing only some salt and pepper. A good piece of advice before you taste meat from wildsheep: Do not expect it to taste like sheep and be open for new and thrilling tastes.